To maximize the overall appearance of your finished preserved bridal bouquet, follow these important steps: You should use a throwaway bouquet instead of using your original bouquet during the traditional bouquet toss at your wedding reception. Store your bouquet and other flowers that you wish to preserve in the refrigerator. It is very important that you DO NOT put water ON your flowers. You should put them in about an inch of water (enough water to feed the stems). Refrigerate your arrangement as soon as possible. DO NOT put your flowers in the freezer, or close to the freezer. Its best to keep in the lower front part of the refrigerator. At this point, you should plan to deliver your flowers as soon as possible. When you drop off your bouquet and boutonniere I take a photo of it to ensure accurate replication. I will take the bouquet apart and start the drying process. The bouquet will stay in the drying process for 30 days. I require the money for the drying of the bouquet and boutonniere at the time of drop off (cash or check only). The price for drying your bouquet will vary depending on the type of flowers and the size of your bouquet. After 30 days YOU will need to contact me to set up an appointment to pick out your shadowbox or other container you wish to display for your flowers in. When you come and see the flowers at this appointment your bouquet will be in pieces and completely dried. 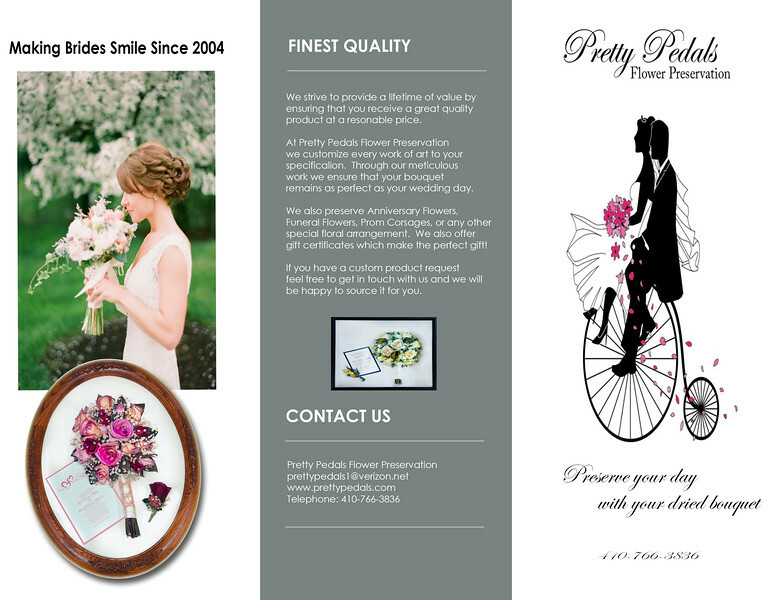 At this appointment you will need to bring in the things you may want to incorporate into your arrangement. For example your invitation, garter, pictures, headpiece, etc. The price will vary depending on what kind of shadowbox or container you choose for your flowers. The price of the shadowbox or container you choose for your flowers will be due at this appointment (cash or check only). 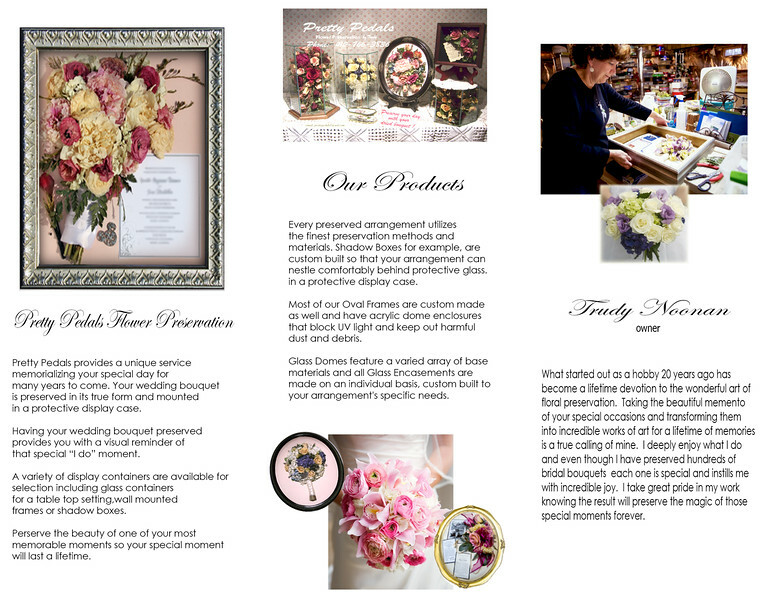 Once your bouquet is completed within the shadowbox or container of your choosing I will call you for final pick up. Final delivery is subject to the volume of business. Bouquets that are left over 90 days are subject to disposal unless the customer has made other arrangements with me. Once you take your bouquet home DO NOT put your arrangement in bright sunlight or in a bright room with lots of light. During the summertime do not put in a room with high humidity or damp places. Do not place your arrangement under any heating ducts. I guarantee my work for 30 days. After 30 days a fee will be incurred for reopening your container.